As more savvy consumers reject traditional advertising and instead turn to recommendations from social media influencers, brands are embracing influencer marketing like never before. Right now, brands connect with influencers by manually looking for them on social media and then send them outreach emails to begin the partnership. There are plenty of flaws with this manual approach. Finding the right influencers for your brand is an overwhelming task, and is time-consuming and labor-intensive. AI can not only simplify this process but also can make it better. Using AI and machine learning tools in your influencer marketing campaigns offers plenty of benefits. Yes, you could get a team of interns to sift through influencer feeds on social media, and review every post to find the best influencers for you. But AI can do all of this quickly and more accurately. It helps to make influencer marketing more scalable and ROI-focused. It can help you make the most out of your Influencer generated traffic and drive more conversions. What Can AI Do to Improve Influencer Marketing? AI has progressed by leaps and bounds in the last couple of years, and the growth is expected to hit exponential rates in the coming years. Right now, the success of your influencer marketing campaigns can be measured only after the project is done and dusted. What if you could predict your success levels, even before the campaign is launched? A recent study by MediaKix stated that the global influencer marketing spend is set to reach a whopping $10 billion by 2020. With so much at stake, wouldn’t it be great if you could predict the outcome of your campaign before you spend a dime? AI can isolate variables and show digital marketers the best way to build an effective social media marketing strategy. Using predictive analysis algorithms, you can easily predict with accuracy whether your campaign will deliver a high ROI. This will help to reduce the overall costs, as you can avoid spending money on campaigns that won’t be successful. This helps to increase ROI from your influencer marketing. Human beings are multifaceted creatures. Classifying influencers solely based on their niche or depending on their industry to segregate them is an inadequate approach. According to a survey by Econsultancy, finding the right influencers is one of the biggest challenges facing marketers today. Over 73% of respondents stated that they have a hard time finding the best influencers for a campaign. To identify the “perfect” influencers for your brand, you need to take an objective approach based on the content influencers share instead of a subjective search based on keywords or categories. Current AI systems can already categorize image content based on several variables. In the coming years, you can expect more sophisticated content classification by AI systems. This will give brands an easy and effective way to categorize influencers accurately, based on their content profile. We at Grin are already using AI to create data-based profiles of both brands and influencers. This information is derived using a wide range of variables. It helps you find the best match, thereby making it easier for brands to find the perfect set of influencers. With AI, influencer content profiles will become streamlined and fast, thereby helping digital marketers make the right choices when it comes to choosing influencers for their marketing campaigns. 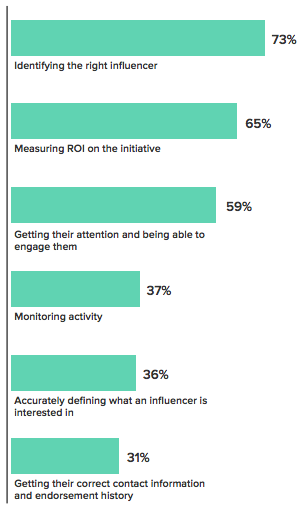 Currently, influencer marketers evaluate the efficacy of their campaigns based on monthly or even yearly data and statistics. With new developments in AI-based tools, we can expect huge growth in the measurement of influencer potential. Influencer efficacy measurement will get better and can be analyzed on a more micro level, even on a post-by-post basis. This is a huge help for marketers as it can improve reporting and testing abilities significantly, giving brands instant feedback. Brands can then use this feedback to refine and optimize their marketing strategies, thereby boosting the chances of success of their influencer marketing campaigns. Additionally, this also helps brands alter the way they incentivize influencers. Right now, most influencers charge a fixed rate for a sponsored post, regardless of how the post performs. Take a look at the average rate per sponsored Instagram post across verticals. On the other hand, by using the AI to assess influencer potential, brands can alter incentives based on post performance. For instance, if a particular post fails to reach the required level of engagement or exceeds goals, the marketer can adjust influencer incentives accordingly. Today, all social media networks are filled with spam and junk accounts. Ensuring that your influencer marketing campaign is clean and doesn’t fall prey to nefarious activities is a highly critical task. As the dollars spent on influencer marketing keeps increasing, there are plenty of fake influencers looking to cash on this trend. According to a recent report published on AdAge, influencer campaigns have exposed some of the biggest consumer brands to fake followers and fake engagement. Some of the bad practices in the industry include – buying fake followers, comments, likes, and even plagiarizing posts and content from others. A popular example is the notorious Instagram Pods that trick the Instagram algorithms to show posts to a large number of people. 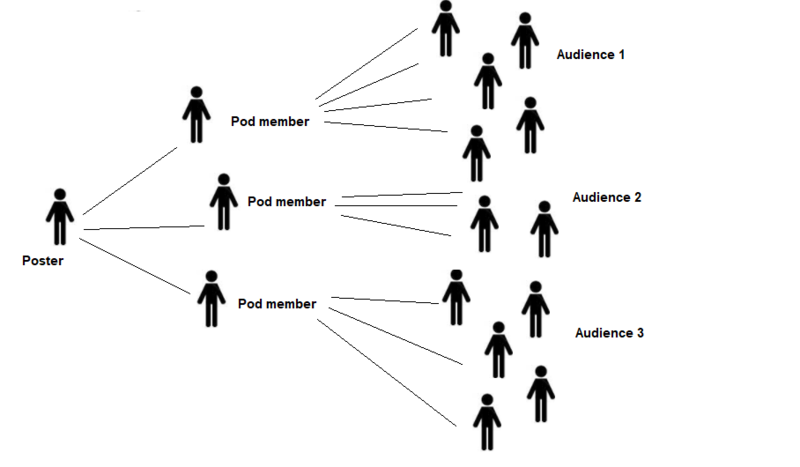 Here’s an illustration of how these Pods work. A post by BuzzFeed News explained how Facebook recently cracked down on several Instagram pods, thereby shutting down these misleading accounts. By including a fake influencer to your campaign, you not only end up losing a huge marketing budget but also lose your revenue and run the risk of damaging your brand’s reputation. This is where AI and machine learning tools come into the picture. These tools can track several data points and use it to assign “authenticity scores” to influencers. Engagement and follower count over time. It takes a while to build both. Usually, fake influencers resort to buying these, which means their follower count or engagement rate increases instantly, and not organically. Number of sponsored posts over time. The higher the number, the more authentic the influencer. Using AI tools, you can even create a large database of previously vetted influencers. This value addition provided by AI-tools offer you enormous benefits. It helps you make smart decisions while choosing the right influencers. It also helps you stay clear of influencers who engage in fraudulent behavior like amassing fake followers, gamed engagement and more. All of this helps to boost your influencer marketing ROI. Manually browsing through thousands of news feeds to find the right influencers who are the right match for your brand is next to impossible. Not only does it take a lot of resources and time, but it’s also not comprehensive. Image recognition technology plays a key role in understanding influencer content. Most influencers don’t post much about their images. They add very little description and few generic hashtags. Yet, their engagement rates are high, because their followers understand the context of the post. @KimKardashian regularly posts pictures on Instagram with nothing but a few emojis. Yet her posts never fail to attract millions of likes and thousands of comments from her followers, because they are aware of the context of the pictures and can decipher it without any hashtags or captions. AI can help you identify how audiences react to posts from influencers. By using image-recognition tools, you can find relevant influencers who post in your niche. Recognizing images is just the beginning. Advanced AI tools will be able to uncover tons of other information from social media posts. By using this tactic, digital marketers can find the right influencers, build better relationships with influencers, and derive exponentially greater ROI from their influencer marketing campaigns. Contrary to what critics say, AI is not a buzzword, but a revolution in influencer marketing. So what can we expect from the rise of AI and machine learning? And what will its impact be on influencer marketing in 2019 and beyond? Contrary to popular belief, AI in influencer marketing doesn’t refer to “Sophia-like” robots. Instead, AI and machine learning will use intelligent algorithms and a data-led scientific approach in influencer marketing. The key role of AI will be to measure and predict the outcomes of marketing campaigns. For brands, this presents a world of opportunities. Businesses and marketers will have better control over their influencer marketing campaigns, thereby boost ROI exponentially. Are you ready to start using AI-tools for your influencer marketing campaigns? Have you come across other benefits of using AI in marketing? Let us know in the comments below and let’s get the conversations started. Brandon Brown is the CEO of Grin, an influencer marketing software solution for brands. Grin’s software helps customers identify, recruit & activate the world’s most engaging influencers. Prior to Grin Brandon led marketing for the #1 energy drink market in the world, Los Angeles & Orange County, at Red Bull North America. He is an expert in consumer marketing and has extensive experience working with with the worlds largest brands to reach consumers through influencers, athletes, musicians and artists.